The significance of Micro, Small & Medium Enterprises (MSMEs) to economic growth and prosperity is well established. They provide the critical depth to the manufacturing and service sectors, foster entrepreneurship and generate substantial employment. The MSME sector has been recognized as engine of growth all over the world. It plays a very significant role in terms of inclusive growth and contributes to the process of economic development, equitable distribution of national income and balanced regional dispersal of enterprises. More than 90% of world’s businesses are MSMEs. This means that there are more than 500 million MSMEs in the world. Globally, MSMEs represent 90% of all goods exporters. They account for 50% of Global GDP and are responsible for 70% of the total employment. Policymakers, business leaders, and independent economists universally agree that there is far unlocked potential to MSMEs in the world. MSMEs are a critical force in realizing the Sustainable Development Goals (SDGs). In India, close to 45 per cent of the total manufacturing output and 40 per cent of the country’s exports is contributed by the MSME sector. The sector is the largest generator of employment after agriculture. Its growth is essential and is extremely crucial to the future of India’s growth. On the 6th of April, 2017, the United Nations General Assembly adopted a resolution recognizing the crucial role Micro, Small, and Medium Enterprises play in achieving the 2030 Agenda for Sustainable Development. The resolution designated June 27 as ‘Micro, Small and Medium-sized Enterprises Day’. MSME Day highlights the strong contribution of MSMEs worldwide to livelihoods, communities and economies and the need to support MSMEs towards their success. 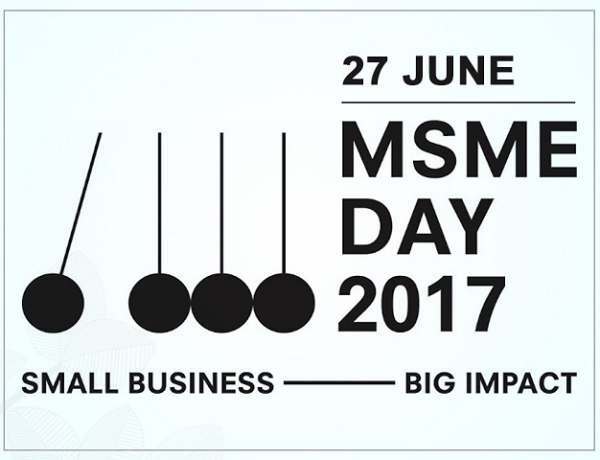 The objective of instituting June 27 as World MSME day is twofold (1) To raise public awareness about the importance of MSMEs to economic growth and international development. (2) Advocate for and provide increased support to MSMEs. Small business – big impact! Celebrating the first UN MSME day, India’s Union Minister for MSME Kalraj Mishra gave away National Awards to Micro, Small and Medium Entrepreneurs for their outstanding performance, to express the gratitude of the Government to the achievers in this field which is so important for the national economy. The Ministry also launched ‘Digital MSME Scheme’ and exchanged three Memorandums of Understandings with SAP India, Intel and HMT. These steps would further boost Ministry’s effort towards making the Digital India Mission successful. Innovation In Fund Raising: For the majority of Indian MSMEs, Start-ups, and growing businesses looking to scale up, access to finance has always been by far one of the greatest hurdles. New ways of raising finance whether it is through the new opportunities provided by FinTECh companies or by P2P lending platforms or through the IPO platform has to supplement the role played by traditional Banks and NBFCs in providing capital to MSMEs. Digital Transformation: ICT has a big role to play in driving innovation and enhancing efficiency of MSMEs. Most SMEs operate in an extremely competitive business environment, and hence it is imperative that they optimise business practices. This effort has to be significantly supported by ICT. Ease of Doing Business. For MSMEs, this is much more important than anything else. MSMEs needs an enabling ecosystem which is built on the fundamentals of reducing complex procedures and compliances with provisions that ensures time bound clearances. MSME Capacity Building. Cluster development initiatives that nurtures best practices for MSME Capacity Building is an imperative. Capacity Building has to be imbibed through Technology Interventions and Skill Development initiatives that involves raising awareness, assessing, counselling and handholding MSMEs to build their competitiveness in the global marketplace. Brand Building. India’s MSMEs find it difficult to penetrate markets which features number of large players in the industry. However, with proper brand building, things can become easier. SMEs that manage to position themselves as brands are often able to attract more customers. The digital world has opened up plethora of avenues for MSMEs to engage with their customers. Many SMEs specifically the OEMs for some major brands have now the opportunity to come out of the closet and market themselves. MSME Centres of Excellence. To ensure MSME competitiveness, it is essential that there are centres of Excellence that can help MSMEs build product innovation, develop process and business expertise through design and technology interventions at multiple levels of interaction. Zero Effect. Zero Defect. It is imperative that MSMEs and small businesses address the quality and ecological needs of domestic and overseas customers, society, employees, partners, regulators, and investors. Ensuring quality focus of India’s MSME is critical as it will contribute to the overall growth of the manufacturing sector and enhancing their competitiveness in the global marketplace and making them an important cog in the wheel in the ‘MAKE-IN-INDIA’ campaign.